[BBC] – The Islamic State militant group has released a video online purporting to show the killing of a US journalist. 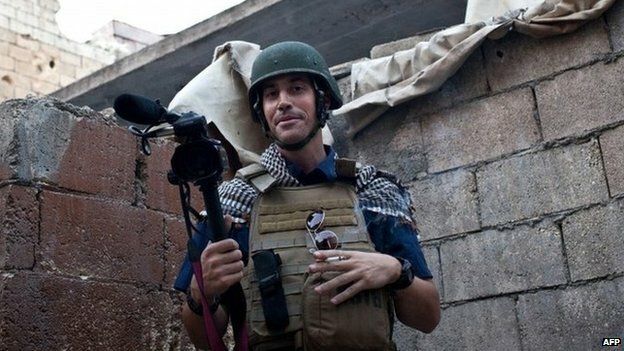 The victim was identified by the militants as James Foley, a freelancer who was seized in Syria in late 2012. The militants said it was in revenge for recent US air strikes against the Islamic State group in Iraq. The video has not been independently verified, but the White House said if it was genuine, the US would be “appalled by the brutal murder”. Foley has reported extensively across the Middle East, working for the Global Post and other news outlets including the French news agency AFP. In the video, titled A Message to America, a man who the IS said was James Foley is shown being held by a masked militant in desert-like terrain. The militant, who speaks with a British accent, says the journalist’s death is the direct result of US bombing of IS targets in Iraq. The US has recently carried out a number of air strikes against IS militants, who have swept through large swathes of north-western Iraq. The footage also shows another prisoner identified by the rebels as an American reporter. IS militants have been accused of massacring hundreds of people in areas under their control in Iraq and also in eastern Syria. The violence has displaced an estimated 1.2 million people in Iraq. Pursuing an extreme form of Sunni Islam, IS has persecuted non-Muslims such as Yazidis and Christians, as well as Shia Muslims, whom it regards as heretics.